Relay for Life is the fundraising branch of the American Cancer Society- an organization that works to fund research for all types of cancers. The people that are involved in this organization are simply incredible, and I hope you'll keep reading as I share a little bit about a few of the individuals running the Los Lunas Chapter. Karin Trujillo is an amazing woman. I have been blessed to know her for a large portion of my life. Her daughter, Amanda, and I were in Girl Scouts together, and Karin was an avid volunteer for a number of years. Karin is the Librarian at Valencia Middle School, after serving in the same position at several other schools in the Los Lunas School District. She is passionate about all types of literature, and loves to inspire students to read. Karin is one of a core group of people that keeps the Los Lunas Relay for Life chapter running year-round, and she is the head of the New Mexico Cancer Action Network- the branch of the American Cancer Society that lobbies our state government to support laws and funding for cancer research and cancer patients. Carrie Ortiz is a phenom as well. Carrie and I were also in Girl Scouts together, so I've known her a number of years. Carrie is an Elementary School Teacher, although I'm not certain what school she works at. Carrie loves to work with people, and always does her best to bring her 'A' game. Along with Karin, Carrie is one of a core group of people that works to keep our local chapter going. She is amazing at finding what people are best at, and pulling them in to use their skills in support of Relay for Life. Carrie works year-round to come up with new and innovative ideas to get people involved in Relay for Life. I wish I could say I knew this much about the rest of the core group that runs our Relay for Life chapter, but I don't. However, they all deserve recognition, and I will do my best to list as many names as I know: Louis, Lacey, Sarah, and Calla. There are a few more, as well as countless Team Captains and Team Members who also deserve recognition. All Relay for Life events begin with a traditional flag ceremony- performed by a local Girl Scout troop, and the singing of the Star Spangled Banner. 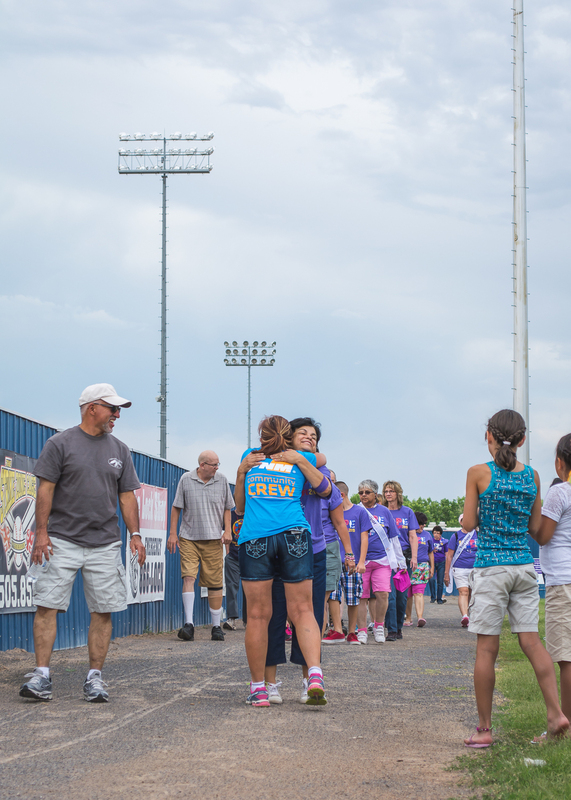 The first lap of the evening is always given to the Cancer Survivors and their caretakers that are in attendance. This is always an emotional lap, as these people have survived a disease that just 50 years ago was a death sentence, and 100 years ago was inexplicable in medicine. They went through hours of treatments, surgeries, and illness, and they never gave up. They are survivors. Shortly after the Survivor Lap, the party gets rockin'! Our local chapter sponsors a volleyball competition, horseshoe throwing contest, and all sorts of entertainment- even from the Dance with Me Dance Studio! Teams sell different items to raise just a few more dollars for this year, and everybody has an awesome time socializing and reconnecting with friends, teammates, and family. It was a blessing to be able to capture this event with my camera, especially since I've seen how cancer has touched my life. You see, my paternal grandmother passed away due to breast cancer, and my great-aunt passed away due to ovarian cancer. I've even had a few friends fight the battle; some have won, while others have lost. In closing, I would encourage every single one of you to get involved with the amazing organization through our local chapter. You can participate as much or as little as you like- there is a place for everyone. If you'd like more information, I would love to help you out.